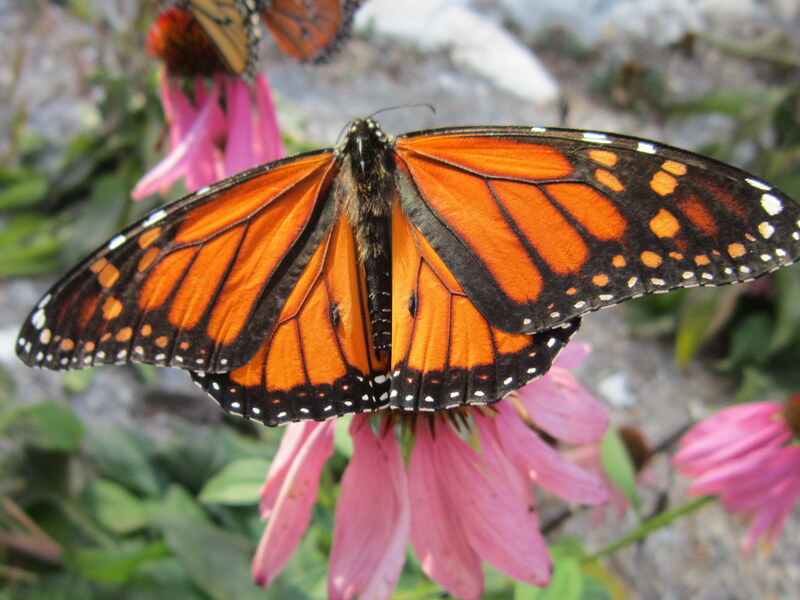 Something unexpected happens when these two seemingly very similar butterflies, shown above sharing a coneflower in my Texas hill country garden, open their wings. And both, if you look carefully, can be identified as males by the scent spots located on their hind wings, one on each side of the lower abdomen. It’s become a habit for me to look more closely at the insects and other small creatures near my house, but it’s harder for me to remember to look beyond the surface of people as well. But that has its own rewards. Upon closer examination, an odd-appearing man in his twenties turns out to be kind and happy, the learning-impaired grandson of an especially warm-hearted woman. I find that a lady nearing seventy, wearing, in my judgment, unbecoming skimpy clothing, too much jewelry, and too much makeup, is lonely and newly widowed. Write about a time when you learned something important by looking more closely. Complete the following: Beyond the surface lies _______________________. 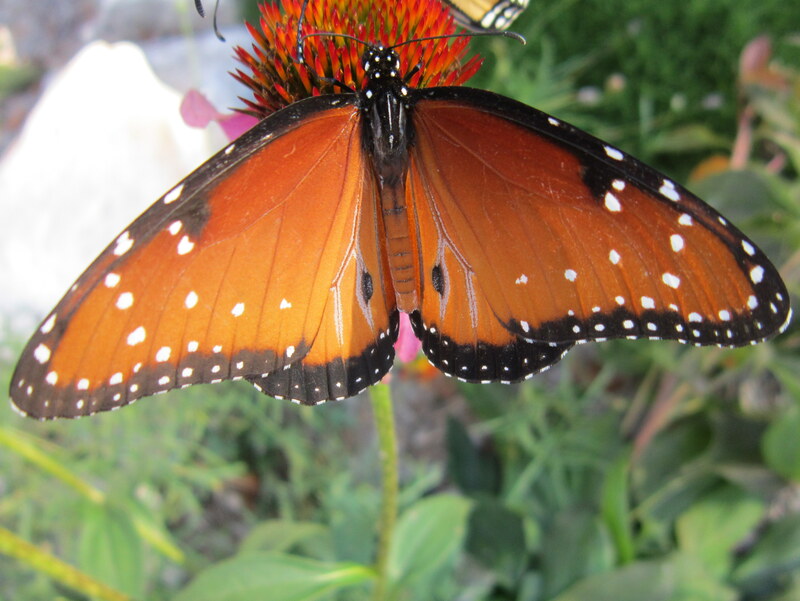 This entry was posted in awareness, butterflies, flowers, human stories. Bookmark the permalink. Thank you for the gift of your noticing and writing. Thank you so much. I appreciate your reading and commenting. Maybe it’s the heat here this week, but I had difficulty finishing up a piece of writing to post. This is a neat post, not just about butterflies, although that would be enough and as it quite dazzled me with your knowledge about the small creatures. I witnessed and stood in the midst of a Monarch migration one beautiful September evening in SW Kansas some years ago. A wonderful experience. About people. In my post on the WWW list serve today, I wrote about the James brothers and this lady I’ve known nearly forever, but never really knew until lately. A beautiful, interesting person, but doesn’t appear so at first glance, maybe not even at second. Thank you, Eunice. I looked for your post on Women Writing the West but couldn’t find it. Perhaps it will be appearing soon? I so appreciate your reading and commenting. Chris, I always love your writtings. You have a beautiful way with words. Thank you too for sharing your knowledge about the monarch. You are so right in how we tend to judge people by what they look like at first glance. Then we take the time to get to know them and many times find the person is much more beautiful inside. Thank you for reading, Sue! You are a good role model because I’ve always felt you see inside people and recognize their inner beauty. You’re such a positive person, and I find that inspiring. Beyond the surface lies heart. Hi, Joe–It’s good to know you’re reading! I love your concise phrasing.